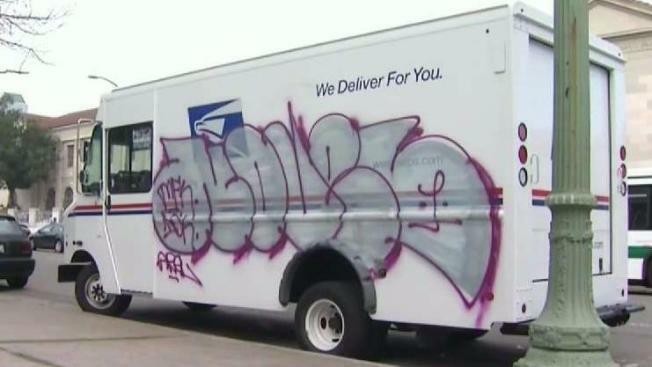 For the past two months taggers have been targeting the mail trucks parked outside the Civic Center Post Office in downtown Oakland. "It's outrageous," postal customer Mabel Villalta said. "I don't think it's right. It should not be happening." Postal Inspector Jeff Fitch said it all started when the post office lost its secured parking lot across the street after the owner decided to build housing there. "It's a crime and it's something we don't appreciate," Fitch said. "At this point we are having to park some vehicles out on the street outside the post office." So far 40 of the 64 trucks stationed at the downtown location have been hit. "I don't like seeing it and I see it every single day when I come to work," postal customer Leola Spencer said. For those who deliver the mail, the spray-painted designs are with them on their routes all day and carry messages they are not used to delivering to Oakland neighborhoods.